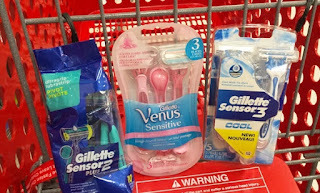 The Target Saver: Target: Venus & Gillette Razors ONLY $1.49 (Reg $7) – Using JUST Your Phone! Target: Venus & Gillette Razors ONLY $1.49 (Reg $7) – Using JUST Your Phone! This week at Target, buy 2 select razors and get back a Free $5 Target gift card. You can get 3-count disposable razors for just $1.49 each when you use your phone! This deal ends 8/11.